We keep our cows in a 28 stall stanchion barn. They lay on rubber mats that are covered with wood shavings. The cows are fed square baled hay and grain. 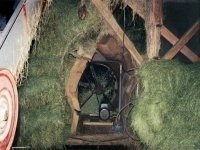 To have consistently high quality hay we keep the hay in the barn, which has two hay dryers. We do not use chemical drying agents. We cut our hay early and get three, and occasionally four cutings of hay per year. Last year we had one field that tested 24% protein. The cows are let out to pasture from spring to late fall. Weather permitting, the cows are let out up to one hour a day in the winter. 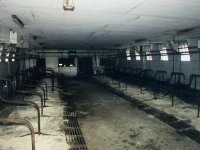 The cows are kept warm in the winter. Even when the temperature drops to 20 below zero, inside the barn it stays between 40 and 50 degrees Fahrenheit. The cows are milked twice a day and we never use BST on our cows. We brush, predip, wash, and post-dip the cows. We keep the cows clean by giving the cows fresh shavings every day, frequently hoeing them, and brushing them before every milking. We also rinse our boots before walking in the area in front of the cows. Last year we had four unannounced milk inspection and the average score of these inspections was 98. Details about our cows can be found using the following links. For complete lactation and genetic information click on any cow's or bull's name.